LEAP DAY....and I made the newspaper! It comes around only every four years — a 29th day in the month of February. We’re not scientists here at "Weekend"; all we know is that it has something to do with keeping the calendar in sync with the Earth’s revolution around the sun, which takes (approximately) 365¼ days. So if there wasn’t a leap day, the calendar would gain a day on the season every four years — or 25 days every century. Before long, we’d be celebrating Christmas in the summer. And July 4th in the winter. Just like Australia. What about one more day to make money? Garzia urges folks to use the day to become more sensitive to the environment. Stop by the store all day, and pick up a reusable grocery bag. Bags, which boast the words “I Love Being Used,” will be given away as long as the supply lasts. Leslie Tetreault, 45, children’s room manager at Richland County Public Library, is using leap day to think about education issues. Staff writers Allison Askins, Jeffrey Day, Natasha Derrick, Mark Layman, Liz Ruiz and Otis R. Taylor Jr. contributed to this story. I cannot believe that I forgot to take a photo of our "booth" at the South Carolina Book Festival. Steve decided that Mouse House, our business that specializes in antiquarian prints, ought to participate as a vendor. He did three book shows more than a decade ago; so felt "experienced". 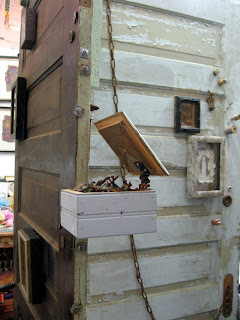 I decided that if he did this, I would display my book art too. For the most part, I sat in our area wrapping rusted nails. This certainly prompted interesting conversations about my upcoming art installation. 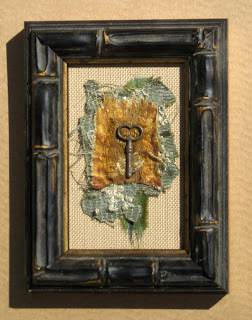 I've also recently finished a few more keys with embellished fabric grounds. I did have my camera with me and I did buy a book for my mom, an early Mother's Day present. 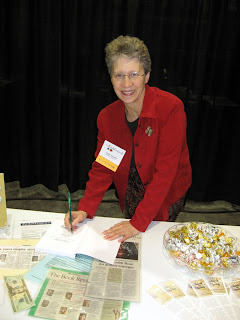 Above is Cristy Fossum signing her book Sunday by Sunday. Mathias is dancing the role of Benno in a place called Sunderland! We've known for quite some time that Mathias was cast in the second leading male part, a principle role, in Swan Lake. The part is Benno, the prince's best friend. Of course, Mathias is in the sixth cast....but it's a principle part and we were hoping he'd get a chance to perform it. Well, he will grace the stage of Sunderland Empire Theater for the matinée performance on March 15. Steve has booked a flight and hotel room. We are THRILLED. To see the casting, click here! Over the past year I've applied for several artist residencies....hoping in a sort of fantasy like way that I might be selected. There are dozens of programs. Some are in national parks. Others are operated by private foundations. 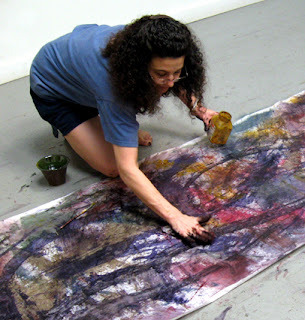 One such residency program is operated by the MacNamara Foundation. I applied.....I GOT SELECTED....six weeks of uninterrupted work time in Maine....mid-September until Halloween! I am beyond happy, beyond excited or thrilled or most of the other "good" adjectives...beyond words! This is world-class. It is also a little scary...in a really good way! My installation is growing. It is difficult to photograph. I cannot back away from it for a good shot. It will be part of the annual spring art event in Columbia called Artista Vista. 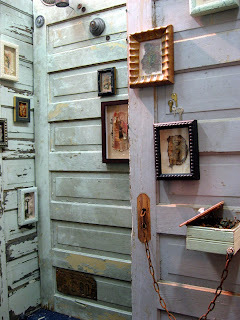 The thirteen artists with studio space at Gallery 80808/Vista Studios always participate with an exhibition. This year, we are calling the show "Personal Grounds". 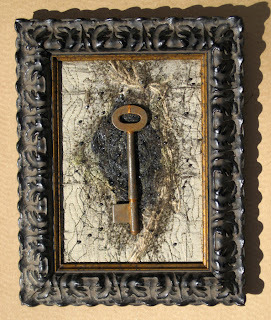 For me, "personal grounds" is the place each one inhabits as a result of the decisions one makes, the paths one takes, the doors one opens, the keys one turns, and the options one exercises. Some of my keys are accessible; some are not. (The Key to Failure is easy to pick up!) Some are labeled; some are not. I've been asked where I got many of them. I bought many of them last January in Murphys, California. 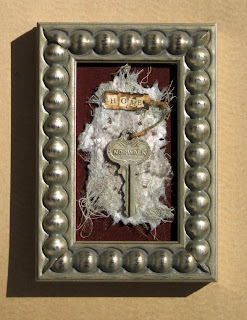 The store has an on-line catalog with a page of antique keys. in this installation are for regret, grievances, loss, childhood, nostalgia, and other bittersweet memories....gone but not forgotten, equal measures of happiness and sadnesses. Rust is among my favorite textures, colors, and compositions. It implies time and an ability to weather a harsh world. My Dad fished out the rusted chain from his lake. 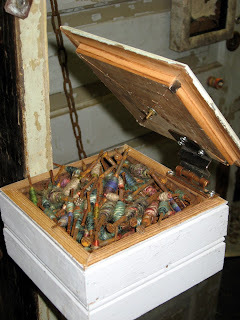 I artificially created the patina on the roofing nails hammered into the ends of the door by spraying them with galvanizing compound, painting them with Modern Option's "copper topper", and staining them with Modern Option's blue patina. 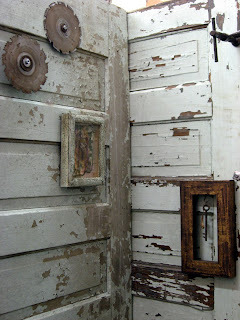 I did the same to the pipe vent, but the saw blades and most of the other pieces are naturally rusted. 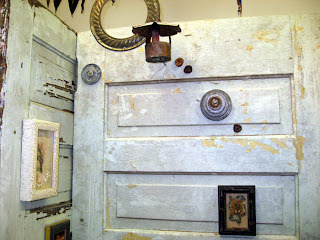 I've also added wooden spools and plan to add many other things...more intuitively than with solid symbolic meaning. I quite enjoy just working...not really thinking. I still need to wrap lots and lots of nails! I will "think about things" then. I've got a long way to go with this project....and then the doors will be unscrewed from one another so that it can be installed in the gallery! Steve continues to visit the studio....he knows he'll be the one to help me move all this! My installation is coming along at a nice, slow, steady pace. I'm really enjoying the art making process. 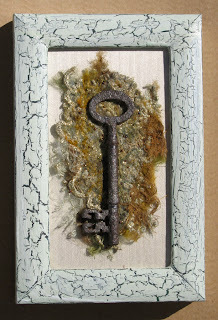 I've been forgetting, however, to take photos of the keys as I've been working on them...until today. One of the reasons I forget to take pictures is because there's generally glass in each piece. Today, however, the sun was shining....very brightly....and I took these photos before fitting the frames with glass...shadowboxing them. All these image are "clickable". 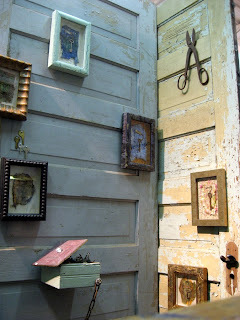 All these pieces will be added to the peeling, painted, wooden doors. I'll try to take some photos of the project tomorrow. It's hard to capture in my studio...it's just too cramped...but it is amazing how the space is transformed into an oasis of creativity! 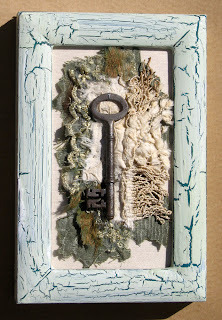 For the past two weeks I've been busy with CYBER FYBER and it is truly an amazing experience to be trading fiber postcards and ATCs, communicating with so many more fiber artist than I thought possible, and balancing this project with the rest of my life. 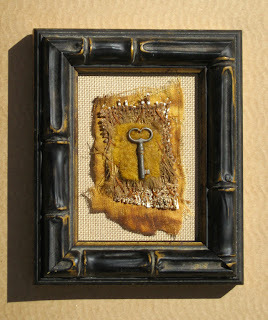 I've got several other art projects going on...all at different phases of creation. Madonna of the Blues too a gigantic leap forward. I really do appreciate all the wonderful comments that were left...especially the suggesting of adding "silver". She is turning into a "major" work, an icon. 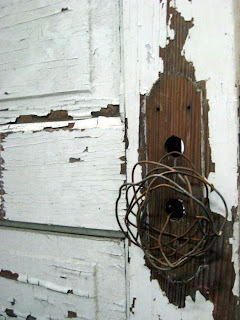 My peeling painted doors, rusted keys, and wrapped nails also made progress. My vision for this installation is becoming clearer. It is also a fun change to climb a step ladder with an electric drill. 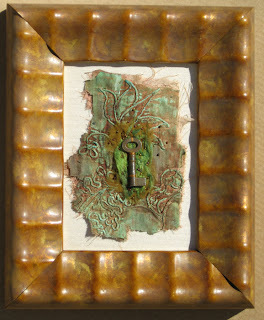 I used the perfectly rusted chain that my Dad fished out of his lake too! Lots of people have stopped into my studio just to see what it is that I'm building. It does look a bit like a construction zone. Over the weekend I was in my "booth". 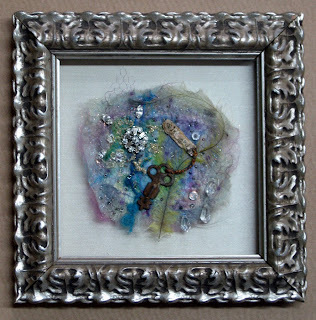 Having already won a top place ribbon, I felt no pressure to sell anything...but I DID! I also learned some very, very valuable lessons from a good friend, Jackie Wukela. I spent Friday night at Jackie and Steve Wukela's lovely country house and we talked about art, selling, and life in general. I had to confess that I'm not very good at "closing the deal" with my own artwork. 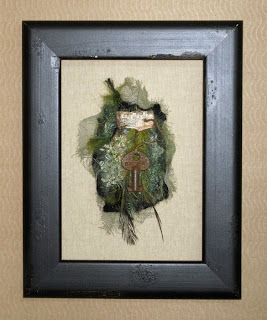 Even after nearly two decades of selling framing (which I'm excellent at doing), I'm just not comfortable selling my art. I can talk about it....just not sell it. Jackie gently told me how to suggest a purchase...in a way that suits me. It works. I sold art in my booth using her advice. What was it? She told me that there is a moment in a conversation when a suggestion can be made...look for it in the customer's eyes. I've seen it often but always let it pass...let the person walk out of my studio, satisfied with our conversation but without thinking about buying anything. At that moment, Jackie taught me to say, "I'd love for you to have it!" It's that simple. It compliments the potential buyer, his or her tastes. Then, give the person some space...permission to walk away but an opening for a sale. It works. At least, it worked for me right away. I didn't feel like some used car dealer. I didn't feel like I was begging for money or desperately needing to sell something. It was comfortable and easy. I am grateful....and amazingly, the people who made purchases were really happy too! Selling art is nice...but it really couldn't compare to the wonderful people I met. 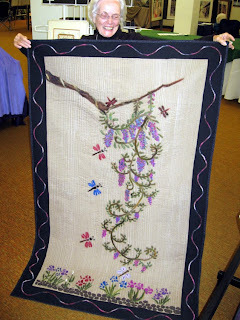 At least three or four women were members of the Swamp Fox quilt guild. A few came on Saturday but returned on Sunday. Above is a lovely lady, Peggy O'Quinn, who came back to show me the quilt she'd made in a workshop in Houston....using the embellisher. It's perfectly hand quilted. 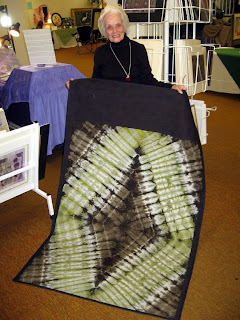 The back includes a hand dyed material she'd purchased in Tanzania! She's a blogger too. The other "wonder" of the weekend was the number of people who instantly recognized my art! "Oh, you had a show at Francis Marion, didn't you? ", I heard over and over again. Without a reception or much publicity, I really didn't think many people would see the show. I thought it was a "good line on my resume" but people did see it, liked it, and one of them bought In Box XXXIX, the award winner last Thursday night! An Evening in FLORENCE....South Carolina, that is! Yesterday Steve and I headed to Florence...South Carolina. It's about ninety miles from Columbia...also South Carolina! It was an evening art reception for the juried exhibit at the Florence Alliance arts weekend. When we arrived, there was already a small work in my "booth" (first time I've ever done this part!) that was labeled as "Patron Purchase Award". I was thrilled. For me, this made my evening. The food was delicious...mostly homemade. There was live music and lots of nice people. At 8:00 PM Carrie Brown, the juror said a few words and announced the winners. I WON ONE OF THREE FIRST PLACE AWARDS! It was wonderful and totally my honor! Now, I'm going back to my "booth"...without a care in the world...if anyone buys anything it's just icing on the cake! PS CYBER FYBER is going well! Keep spreading the word and trading with me! The exhibition is going to be GREAT! Crazy, wonderful, CYBER happy, and more! I've heard that CYBER FYBER is spreading like wild fire through blogland. I hope this is true. Please fan those flames! I'm working like CRAZY...and loving every minute of it. Trades do require lots of steps and several messages in order to keep "real" addresses off public places and in order to keep everything organized and properly labeled for the exhibition next January. Still, I did manage to do a few other things over the weekend. 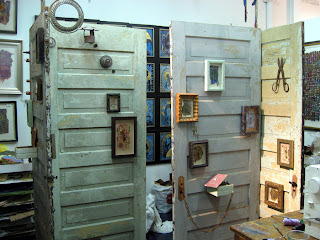 I don't have any new pictures yet, but Decisions, the doors with rusted keys and wrapped nails installation, is progressing rapidly. I spent almost the entire day in my studio working on this last Saturday. On Sunday, the CYBER FYBER trades officially started....and I drove to Florence (South Carolina...unfortunately not Italy!) to set up my very first "booth" in an arts festival. Okay, it doesn't look as "professional" as some of the booths....but it doesn't look bad either. 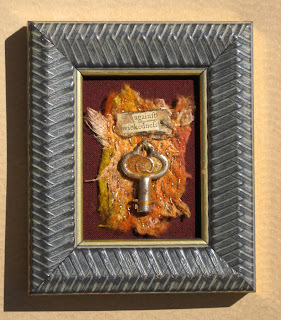 The event starts on Thursday night with a gala reception for the juried work. I've got two pieces in this as well. The sale starts on Friday and runs through Sunday. 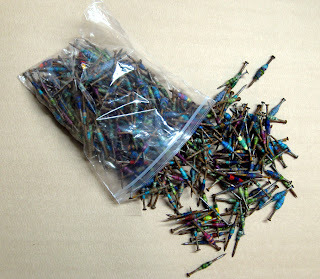 I've got some embroidery to do while I'm there...plus I'll be wrapping more nails...lots more nails. I need hundreds. Believe it or not, I worked a bit on Madonna of the Blues too. No image yet...but it's going to be a bit over the top...just my style! Every free moment is trading postcards and ATCs for CYBER FYBER. 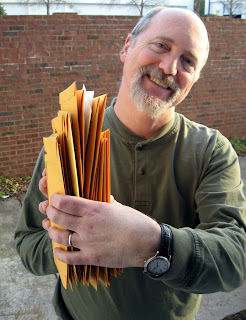 Steve has made some of the runs to the post office...including the envelopes seen below! 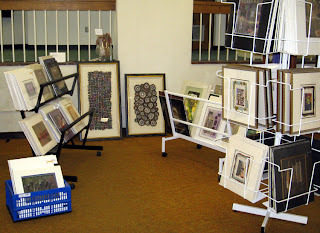 Plus, the Penn Center on St. Helena's Island came by to select four pieces for an upcoming art show there! 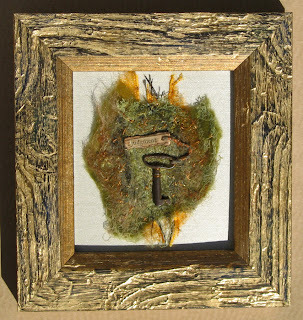 Maggie Grey has accepted her invitation to exhibit at CYBER FYBER! There's no more "Wish List" just reality. Trading is open. There's plenty of work for me to do. I couldn't be happier. About a month ago many of the blogs mentioned New Year's Resolutions. There was a general excitement about new challenges, studio cleaning, and plans for the coming year. I found myself reflecting on the past year, how my life had changed, and how my artwork was progressing. 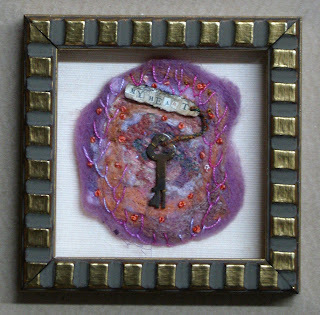 Without a doubt, joining a blog ring and creating a supportive, global community of fiber artists was the most meaningful development in 2007. For this, I thank each person who has visited my blog, especially those who have left a comment. I also extend a heart-felt thanks to all those who share their stitches, their photos, and their lives by posting on a blog. 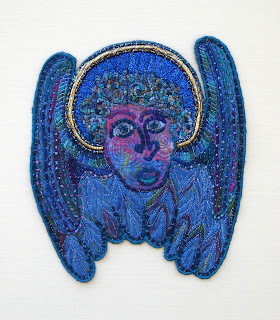 I am in debt to so many talented embroiderers. This is COMMUNITY. I set Saturday, February 2 as my "deadline" to get this prepared. So, in the last four weeks I've made 163 fiber postcards, 130 ATCs, created a series of interconnected blogs that function like a website, uploaded all the photos with descriptions, had Doreen G proofreading, pre-arranged a trade to use as an example with Diane, created a "Wish List" of artists for the invitational section of the show (one of the hardest thing I've ever had to do) and wrote to each with an invitation, started a "budget", and organized EVERYTHING....while still maintaining my own art and blog. Honestly, I didn't think I could do it; but, I DID...with time to spare. Many totally wonderful, serendipitous occurrences happened....like invited artists finding CYBER FYBER and accepting before I ever wrote! I've even conducted several trades this week...which actually helped to teach me my own system. Officially, the trading is now WIDE OPEN! ATCs are here. Postcards are here. I've even kept a "journal" during the past month here. Although trading instructions are included EVERYWHERE...there is even a dedicated space here. Each place has a link back to the main CYBER FYBER page. I've even got a email address specifically dedicated to CYBER FYBER. It is cyberfyber@prodigy.net. This is my THANK YOU to my CYBER FYBER community. Please be part of it! All the traded fiber postcards and traded fiber ATCs will be in the exhibit...properly labeled with each artist's name and blog/website/profile. 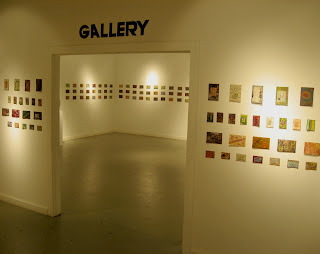 I also plan to look into having the postcards and ATCs exhibited elsewhere...a traveling exhibit. The invited artists are listed here...with reasons for their selection. These artists have accepted (in no particular order! ): Sharon Boggon, Dale Rollerson, Wanda Lenz, Arlee Barr, Doreen Grey, Jill Rumoshosky Werner, Emmy Schoonbeek, Corinne Stubson, Penny Sisto, Jacqueline de Jong, Beate Knappe, Dijanne Cevaal, Veleta Staffney, Nikki Wheeler, Lynda Monk, and Susan Sorrell. I am over the moon about this...and am only waiting to hear from one more artist! The exhibition, however, can only be a success if all three components work....so....PLEASE TRADE WITH ME....I've been on pins and needles all week....nervously waiting until after midnight to post....it's after midnight!